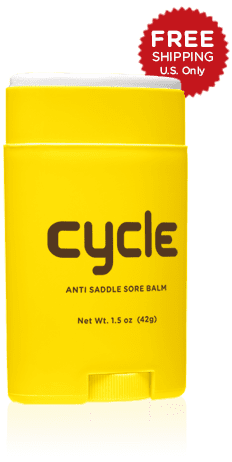 Keeps you on the bike longer by protecting your assets from the friction that causes saddle sores with a dry, invisible, non-greasy barrier that doesn't require frequent reapplication. Unisex. Before you get dressed, to protect, and arrest the rubbing that causes saddle sores. The preferred choice over wet, messy creams, gels and powders. No petroleum, lanolin or mineral oils. Hands stay clean. Applies direct from the stick to your skin, shorts, or chamois. Effective and long-lasting. Use daily to stay in the saddle longer—100 mile rides, and more. No frequent reapplication. Keeps pores clog free. Sweat escapes and lets skin breathe. Cycle clothing safe. I’m an old guy with old skin (etc) to go with it. However my Cardiologist says outdoor cycling and indoor Spinning are the very best ways to work at different levels, monitor HR etc, and use the major muscle groups to best support cardiac functioning and circulation. Unfortunately very much of that sort of thing can create chafing etc problems on feet, groin, and wherever cycling bibs can irritate. Body Glide has been, for me, close enough of a “life savor” that I’ll use that term – Body Glide has been a “life savor” for me. It improves my “quality of life” vis-a-vis cycling that allows me to do so much more, and enjoy it more to boot! I highly recommend Body Glide for any cyclist what has struggled with this aspect of our great sport. Body Glide does wonders for me! I am so stoked I discovered this product recently. You can’t even compare this to other protective skincare products, its like apples and oranges! My bicycle is a Surly Troll touring bike and I just finished up cycling in Spain and parts of Africa, I would cycle between 50-80 miles a day depending on weather and elevation climb. My next cycling adventure starts August 5th from Prudhoe Bay, Alaska down to Ushuaia, Argentina and I will most definitely be glided by Body Glide Protective Skincare! Body Glide Cycle balm is never wet. It has no oils, messy lanolin or petroleum. It has natural plant waxes to protect against rubbing that causes saddle sores. Used for road, race, mountain biking, BMX, cyclo-cross, touring, and commuting.